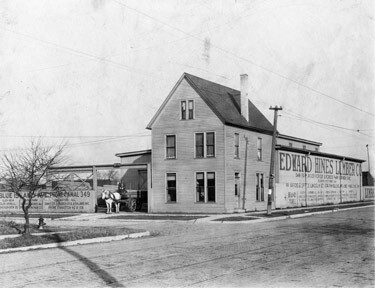 In May 1910, Oak Leaves was touting a new business in the village. They could not have known that the new lumber yard would become a fixture at the corner of Madison and Forest for just shy of a century. And who knows how much lumber purchased at Hines is now incorporated in the homes of River Forest, Oak Park, and the near west suburbs! The following is the full text of an article that appeared in the May 21, 1910, edition of the Oak Leaves. The Edward H. Hines Lumber Company has practically completed the equipment of its new yard at Madison Street and Forest Avenue, River Forest. The branch will be in charge of A.C. Donnell, who has lived in the vicinity for the past seven years, and is well known both in Forest Park and Oak Park. At present Mr. Donnell is living at 116 Marengo Avenue, Forest Park. The lumber yard is well stocked with lumber, lath and shingles, and the firm is better prepared to serve its patrons than ever before." In July of 2009, Hines Lumber called it quits at its original River Forest location, though the company still maintains other lumber yards. The following are excerpts from a Wednesday Journal story about the closing. After nearly 99 years, Hines Lumber is leaving River Forest. First reported 7/16/2009 2:31 p.m.
Edward Hines Lumber Co., a longtime fixture on Madison at Forest Avenue, will close its doors for good this August. Hines CEO Gerald Willie confirmed the store's closing July 15. Willie said the decision to close the full-service lumberyard in River Forest was prompted by a number of factors, not the least of which is the economy. "There's a lot of reasons," he said. "The economy isn't very strong right now." He said another factor was the village's decision to attempt to levy "a special tax" on the business. Willie had asked to meet with village officials on June 22 after reading of the village board's intention to impose a new tax on lumber sales. He described the meeting as "nice and cordial." Willie said he notified Village Administrator Steve Gutierrez of the decision to close the business in a July 8 phone call.